Apollo Medical Devices produces rapid, low-cost, accurate blood analysis systems that require only a single drop of blood. 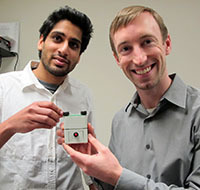 Weighing less than a pound, their device is highly portable and enables use in the developing world, disaster relief, and other areas where blood testing and analysis was previously infeasible. 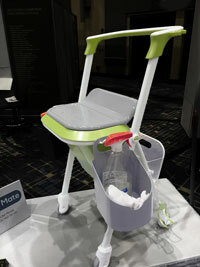 Clean Mate is a hybrid walker, folding seat, and caddy for cleaning products. Clean Mate enables a person with limited physical capabilities to perform household duties more easily. It supports mobility as the user pushes it, provides a seat for resting while cleaning and provides organized supplies storage. Clean Mate assists elderly users who feel dependent on others for home cleaning. The convenient portable caddy can benefit users of all ages who sit or stand while cleaning and it folds for storage. Won second place in the 2015 IHA International Student Design Competition in Chicago. Thirty six straight hours of design, code, caffeine, taking on new challenges, and innovating - that's what hundreds of hackers of all ages and skill levels signed up for at HackCWRU 2015. 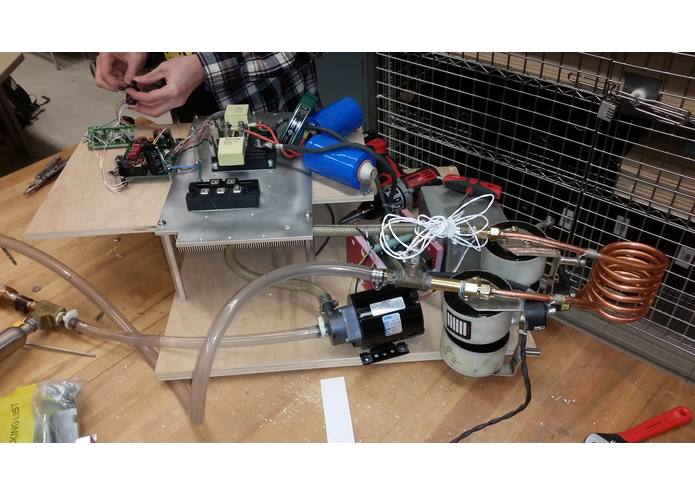 At the end of the weekend, twenty four projects were presented ranging from a virtual reality pancake simulator to a the high-powered induction heater shown in the photograph. Using think[box], attendees were able to hack hardware as well as software, giving HackCWRU a unique twist on the usual hackathon. 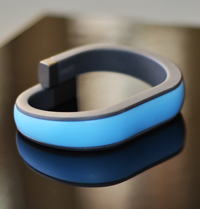 The Everykey wristband stores login information and unlocks mobile devices automatically, eliminating the need for complicated passwords and cumbersome keys. When the AES 128-bit encrypted wristband moves out of range, security mechanisms are re-enabled and accounts are logged out automatically to keep information secure. 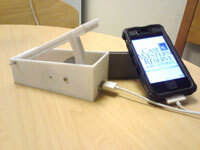 This Cleveland area company began as a CWRU class project in 2012, ran a successful Kickstarter campaign in 2014, and continues to sell these devices to customers around the world. 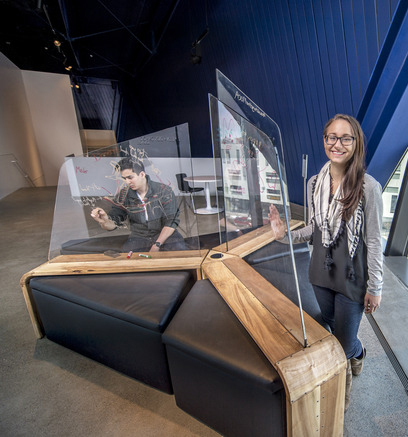 This completely functional artistic seating piece with power outlets and dry-erase work space was installed at MOCA, Cleveland's Museum of Contemporary Art. Designed by students in the Cleveland Institute of Art department of Industrial Design, the large clear geometrical shapes were cut from thick polycarbonate sheets using a CNC table router. This 13 million-year-old fossil may come from an extinct species of turtle named Stupendemys that had a shell up to 6 feet long! CWRU faculty Darin Croft used think[box]'s industrial scanner to create a high quality file for his research into the climate and habitat of southern Bolivia at that time. 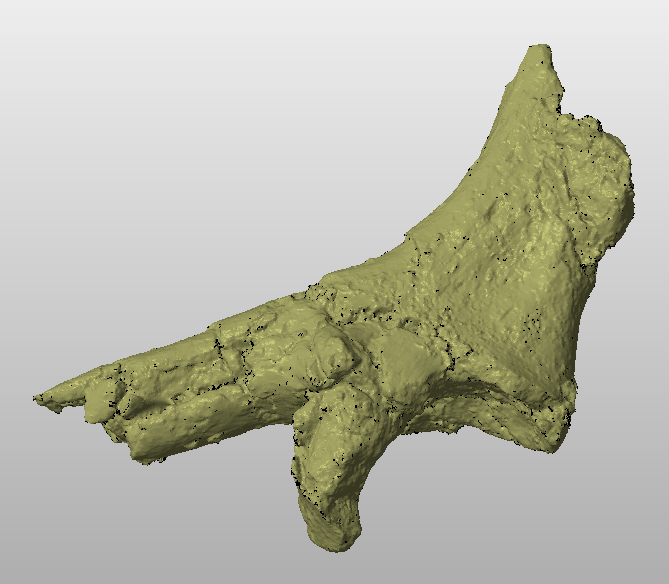 This 3D model will be sent to a turtle expert to determine whether the bones belong to Stupendemys or to some other type of turtle. The answer will provide valuable clues about the ancient environment and elevation of this site, which is now more than 11,000 feet above sea level. This prototype of an ultra affordable, pedal-powered phone charger won over $85,000 from the Spartan Challenge and U.S. Environmental Protection Agency's P3 Grant Competition. It allows the user to non-strenuously charge a phone while leaving both hands free do do other tasks. The design is aimed towards users in countries lacking infrastructure and those not on the electrical grid. This M.S. 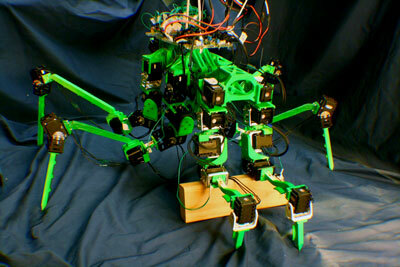 thesis project mimics the mechanics of a praying mantis. The green skeleton was 3D printed, while the control electronics were assembled and mounted on a laser cut acrylic board. 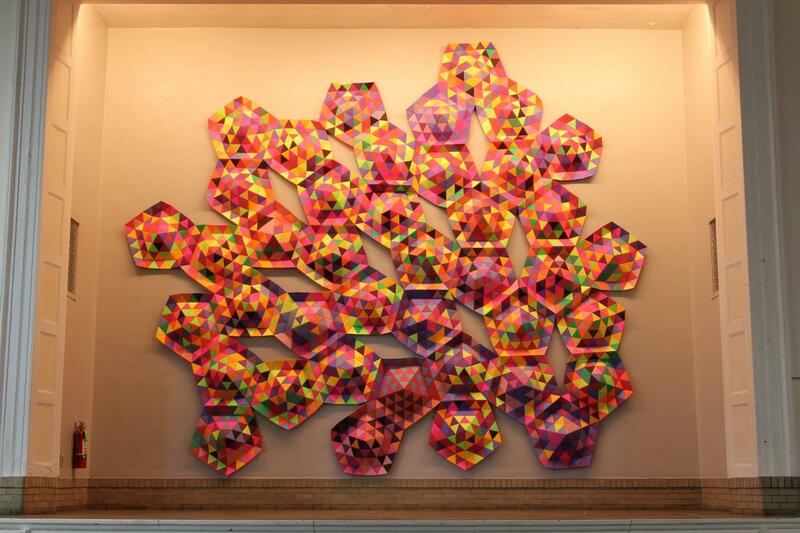 This colorful geometric installation was commissioned by Progressive Arts Alliance to reside in the main hall at the Michael R. White School in Cleveland, Ohio. Artist Jared Akerstrom use think[box]'s laser cutter to prototype and produce the thousands of equilateral triangles for the piece. The shapes were also used at a parent/student night to teach elementary schoolers about the platonic solids. The finished mural was 15 ft. tall and comprised of 3,280 triangles joined with staples. 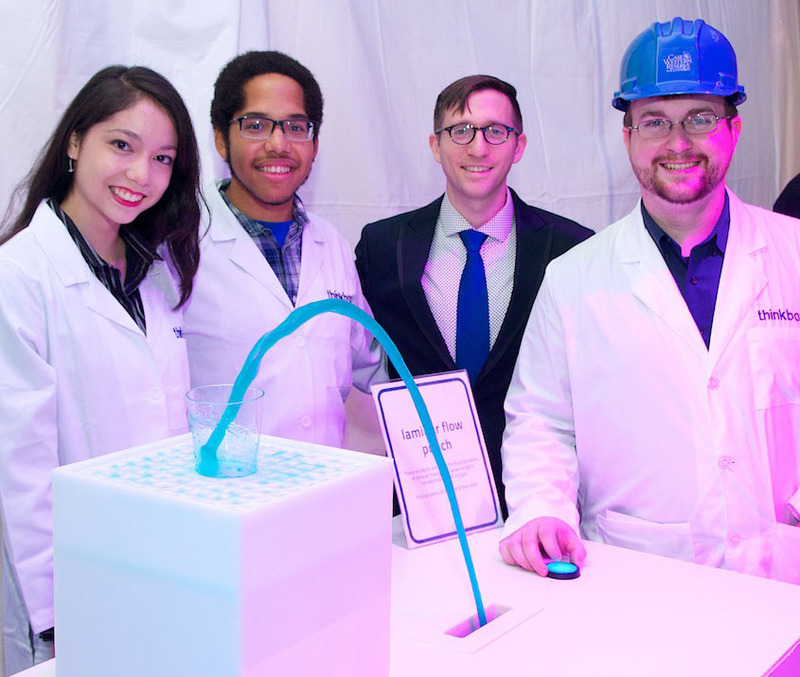 This laminar flow punch dispenser was a special attraction at the 2014 Blue Block party, where President Barbara Snyder announced the launch of renovations of the future home of think[box]. The laminar jet uses technology similar to the dancing fountains found in Las Vegas.